You know, sometimes I forget just how beautiful existence is. I went outside tonight with my telescope for just a few minutes, and I decided to look at the moon for awhile (because it’s easy to find and honestly my inability to do more advanced things with a telescope is sad for a future physics major). While I was out there, I just pointed my phone camera through the lens and snapped a few beautiful photos, if I do say so myself. But I did not come here to brag about my moon photos (though I am really excited to start changing some profile pictures). Really, I came here to talk about how irrelevant each and every one of us is. We really are tiny specs in the universe. I often like to think about the fact that while we humans are still squabbling over territory and resources here on earth, somewhere out in the universe there is a star exploding, maybe throwing the building blocks of life out into the cosmos. We are on a planet, in a solar system, in a tiny part of one of billions of galaxies in our universe. If our entire species were to die out tomorrow, in the grand scheme of things, it would probably make no difference. The picture would remain unchanged. Things would pretty much go on as they were. And I know that thinking about the insignificance of humanity tends to bother some people, but I actually really enjoy it. In fact, it’s sort of comforting, in a way. We humans think we’re so clever. We’ve set up our little economies, explored our little planet, made these little lives for ourselves… and yet it could all be gone in a second. We could all be hit by an asteroid, or a supernova, or a gamma ray burst, and it would all be gone. While some people find this terrifying, I think it’s sort of wonderful, in a way. Thinking about this kind of stuff reminds me how small my problems actually are. Nothing actually matters to the universe, so the only things that should matter are the things that matter to me. And in the grand scheme of things, a few snags in one’s life really aren’t going to make a difference. 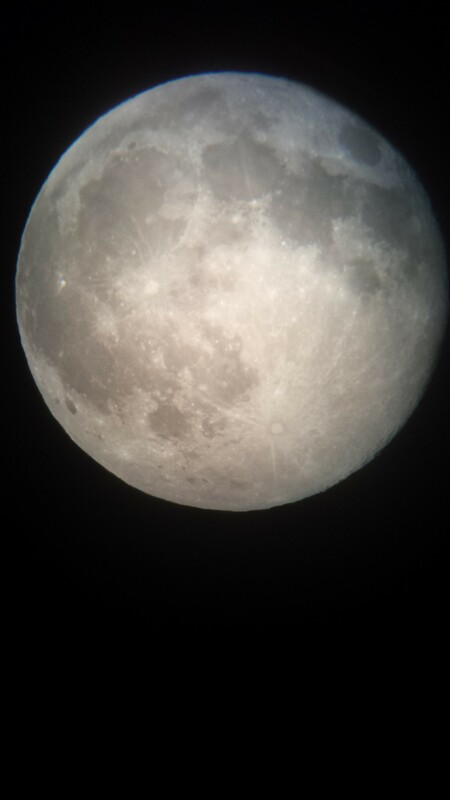 And that’s why I love looking through a telescope. This entry was posted in science and tagged beautiful, moon, picture, science, space, universe, wonderful. Bookmark the permalink. I love love love this. Thanks, Kain.